According to legend and some pagan path gradations the last day to harvest all fruits and vegetables this year is Tuesday, October 30th. After this date we are to leave anything still growing on trees, plants, shrubs, and vines for three main reasons. First reason. 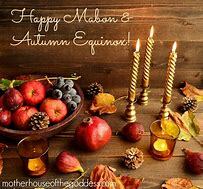 Is as an offering to the Gods, Goddesses, and Elements that helped the fruits and vegetables to mature from the seedlings in the spring until their fruition in the fall. The second reason is to allow the Fae Folk (if you are blessed with them in your yard or close, that help us tend our gardens, trees, shrubs, and flower beds. The third reason is so our wildlife brother and sisters can eat them where they are or bring them into their place of waiting out the cold, rainy, and snowy days ahead. So think upon these things are you finish harvesting what you have grown and leave a few of whatever you do not have to have to feed your family there to honor the Gods, Goddesses, Elements and to help feed the Fea Folk, animals, and birds. 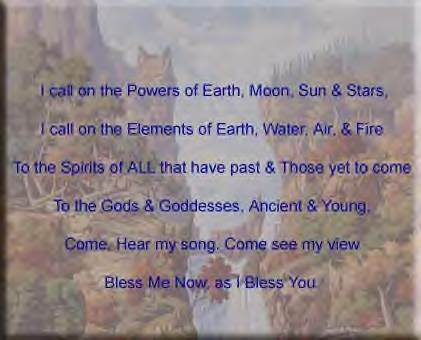 This is another way for us to honor the energy that contacts all things be the part of Mother Earth and/or a deity. Also when you are done with your harvesting do a short ritual to thank everything and everyone for what you have been able to gather through out the growing season. Give the part of Mother Earth you used as a home vegetable garden a good sprinkling with water, add your homemade or if you have to buy compost make sure it is organic. Do not forget to gather and dry your cooking, medicinal, and ritual herbs that are grown outdoors by this date also. For indoor growing herbs just snip some off and sprinkle it in your yard as a thanks and offering. COVEN LIFE STUDENTS ONLY; Write to me if you are not sure how to do a thankfulness ritual. We have chat this Sarurday from 5:00 to 8:00 PM CT where we can discuss this topic further. Readings to inspire the Witch within. Traditional herbalists or wise women were not only good botanists or pharmacologists; they were also shamanic practitioners and keepers of occult knowledge about the powerful properties of plants. Traveling back to the healing arts of the ancient Egyptians, Greeks, and Romans, The Herbal Lore of Wise Women and Wortcunners takes readers deep into this world, through the leechcraft of heathen society and witches’ herb bundles to the cloister gardens of the Middle Ages. It also examines herbal medicine today in the traditional Chinese apothecary, the Indian ayurvedic system, homeopathy, and Native American medicine. Balancing the mystical with the practical, author Wolf Storl explains how to become an herbalist, from collecting material to distilling and administering medicines. He includes authoritative advice on herb gardening, as well as a holistic inventory of plants used for purposes both benign and malign, from herbs for cooking, healing, beauty, and body care to psychedelic plants, witches’ salves for opening alternative realities, and poisonous herbs that can induce madness or cause death. Storl also describes traditional “women’s plants” and their uses: dyeing cloth, spinning and weaving, or whipping up love potions. The Herbal Lore of Wise Women and Wortcunners is written for professional and amateur herbalists as well as gardeners, urban homesteaders, and plantspeople interested in these rich ancient traditions. Many Pagans love to garden, but a lot of people don’t realize you can grow plants and flowers that bloom at night. Cultivating a moon garden is a great way to get in touch with nature, and it provides a beautiful and fragrant backdrop for your moonlight rituals in the summer. If you plant these lovelies close to your house, you can open the windows and take advantage of their aromas as you sleep. Many night-blooming plants are white, and give a luminous appearance in the moonlight. If you plant them in a circle or a crescent shape, when they bloom, you’ll have the moon herself right there “as above, so below.” There are a number of plants that open at night — mix them in with silver-foliaged day bloomers. Around the world, people tend to garden in different ways. Someone living on a large family farm plants their crops differently than someone on a half-acre lot in the suburbs. A resident of a big city in an advanced nation will grow things in a different fashion than a family living in an impoverished, third world country. While one person might use a large tractor and motorized equipment, another may use a simple shovel. Still another might only use a pointed stick to make a hole in the ground. Since time began, the human race has managed to find ways to make things grow where before there was nothing. In the early spring, many of us who follow earth-based spiritual paths begin planning our gardens for the coming season. The very act of planting, of beginning new life from seed, is a ritual and a magical act in itself. To cultivate something in the black soil, see it sprout and then bloom, is to watch a magical working unfold before our very eyes. The plant cycle is intrinsically tied to so many earth-based belief systems that it should come as no surprise that the magic of the garden is one well worth looking into. Let’s look at some of the folklore and traditions that surround gardening and planting magic.